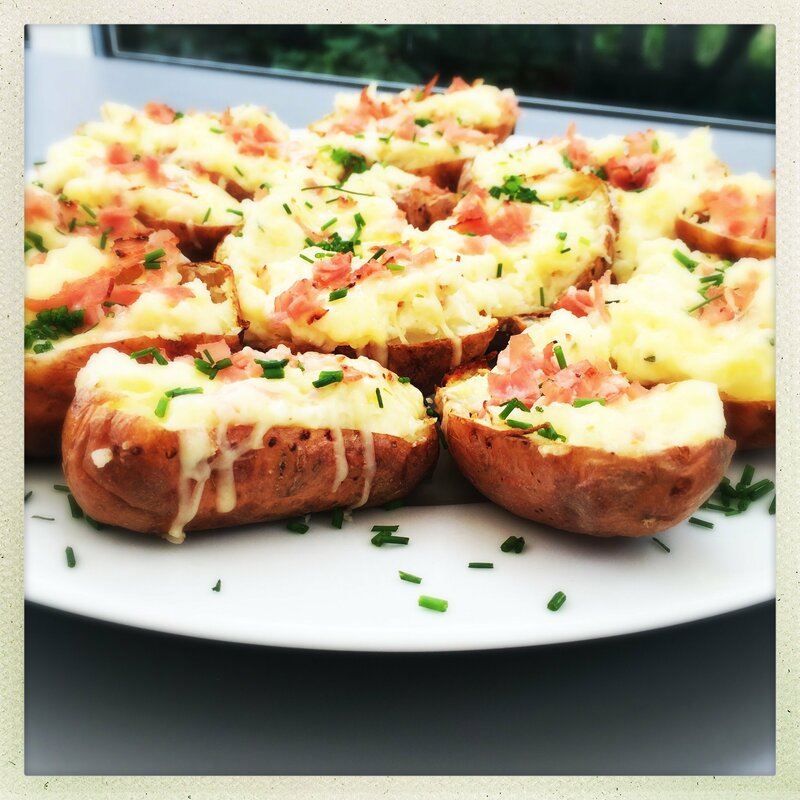 Mmmmmm these loaded potato skins are just far too good! They’re totally moreish and utterly delicious. Loaded skins make a great game day snack and are great for bonfire night parties or autumn barbecues. They’re really easy to make and you can swap and change the ingredients to suit your own likes. 100g wafer thin ham slices - snipped with scissors into little shreds. Scrub the potatoes and pat them dry with kitchen towel. Prick them with a fork all over then put directly onto the oven shelf and bake for around one to one and half hours until they're soft to squeeze. Remove them from the oven and leave them on one side until cool enough to handle. Then slice into halves lengthways, scoop out most of the potato and put into a bowl. Mash the potato with the soured cream and chive dip. Stir in half the grated cheese and half the ham. 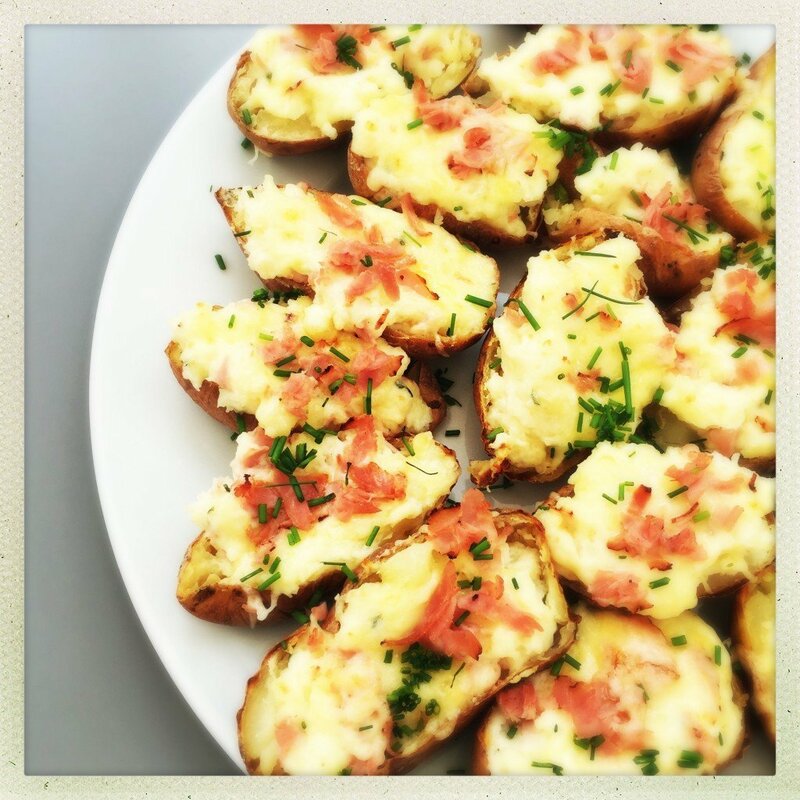 Refill the potato skins, scatter with a little ham and grated cheddar. use sweet potatoes instead of regular ones. go vegetarian and switch the ham for tinned beans. switch the soured cream dip for spicy salsa for a lower fat version. delicious as part of any autumn dinner. still yummy cold the next day – pop in lunch boxes.